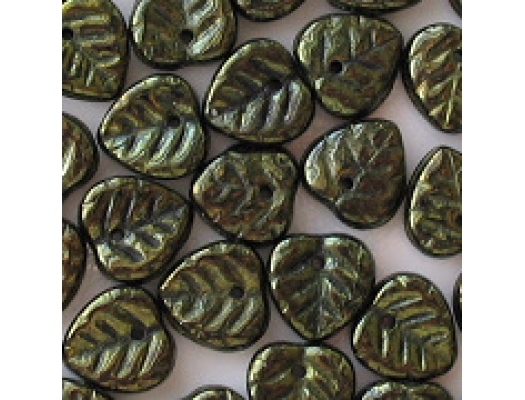 10mm (top to bottom and side to side) leaf-shaped beads with the hole running front to back through the top. 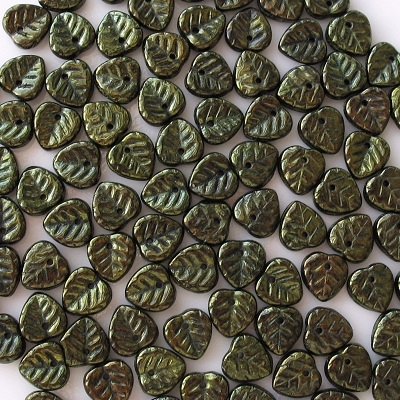 Glass beads (probably clear) with an opaque olive-green metallic coating. The beads appear to be in good shape. 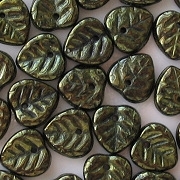 The original large photo showed that some of the embossed veins in the leaves are a little rough, but it is hard to see those details with the naked eye. The photo also shows one bead with white specks in the glass, but the other beads seem to be okay. First, please note that the hole is not sideways, and that means you'll probably have to use a jump ring to make the face of the bead show. Regarding the photo, it is important to remember that the photo is an enlargement. 10mm may sound sizable, but the beads are really fairly small.